Best Album: Mordechai Ben David – Kulam Ahuvim. In my opinion, MBD’s most recent albums were not up to par to his earlier offerings, so this new album came as a surprising breath of fresh air. It was MBD as he used to be, with the up to date contemporary sound that has become in style the pas few years. Loved every single song. Best Song: Mordechai Ben David – B’Inyan HaSimcha. Now, I’m chasidish, and we don’t speak Ivrit or appreciate Ivrit songs. But the upbeat tone and liveliness of this piece just takes my breath away every single time and finds me bopping along. Loved it. Best Debut Album: Benny Friedman – Taamu. All of the contestants had wonderful debut albums but I found Benny’s the best of the bunch. Best Arrangement: Kol Noar Boys Choir – Az Yashir. Seriously – I have never heard a Jewish music song with this kind of rhythmic arrangement. I find myself dancing and bouncing every time I hear this song – which isn’t heard often enough of\n the airwaves these days. Best Choir Album: Miami Boys Choir – Yovo. Admittedly, I’ve been a diehard Miami fan for years and years. I love Miami albums. This one – Yovo – just rendered me speechless. Every song is so full and rich, every solo so resonant. I can’t get enough of this one. Best Yiddish Song: Michoel Schnitzler – Mein Kind Tref Mich. This song has become a fun anthem in my house when we play hide-and-seek, and both my 1 1/2 year old and 4 year old love singing the chorus, so this was a no-brainer for me. 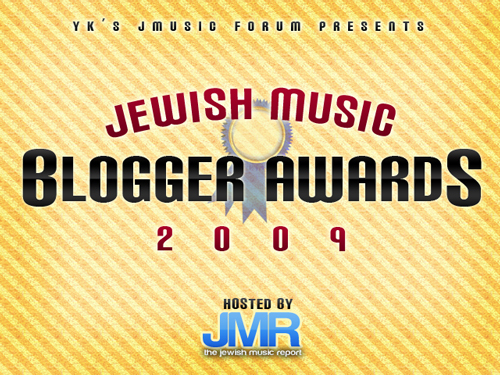 Best English Song: Shloime Kaufman – Sunshine in the Rain. I have no words to describe what this song means to me. As many of you know I waited 9 years to achieve the blessing of motherhood. It’s just amazing that Shloime was able to put into words what so many feel. It was a beautiful song without coming across preachy or pitying. The oilam on the infertility message boards all loved it. Hands down the best English song in this category in my opinion. Best Concert DVD: Miami Boys Choir – Yovo. This was such a tough one. I LOVED the Event DVD. I didn’t see all of the other DVDs – The Avraham Fried and Ohel are so brand new I didn’t see them yet. I heard a lot about Kumzing and it’s supposed to be great. But the Yovo DVD took my breath away. The concert was just flawless, stunning, amazing. The bonus commentary was fantastic, a great behind the scenes look at Miami Boys Choir. Loved it. Hey, it’s nice to have an opinion on Jewish music once again! Thanks for arranging this wonderful contest!